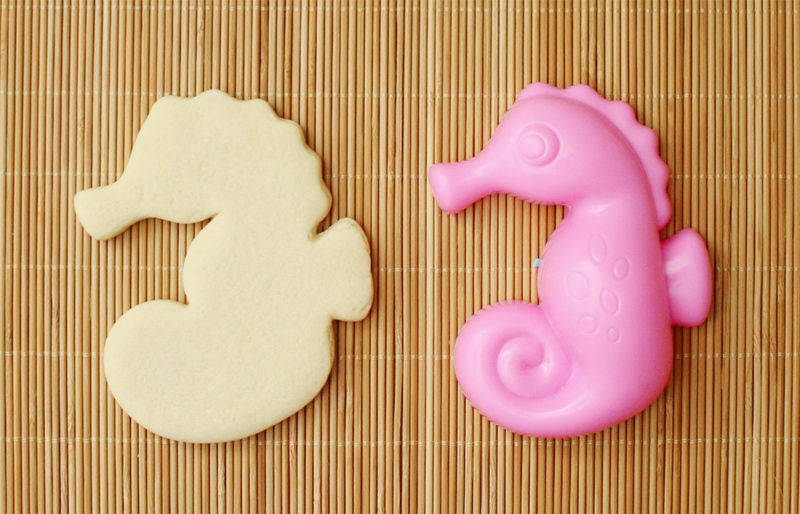 My favorite part of cookie decorating is designing the cookies. A very close second is piping all the final details. To be honest, sometimes I find all the piping and filling in the middle to be a little dull. Plus it can be really time consuming. 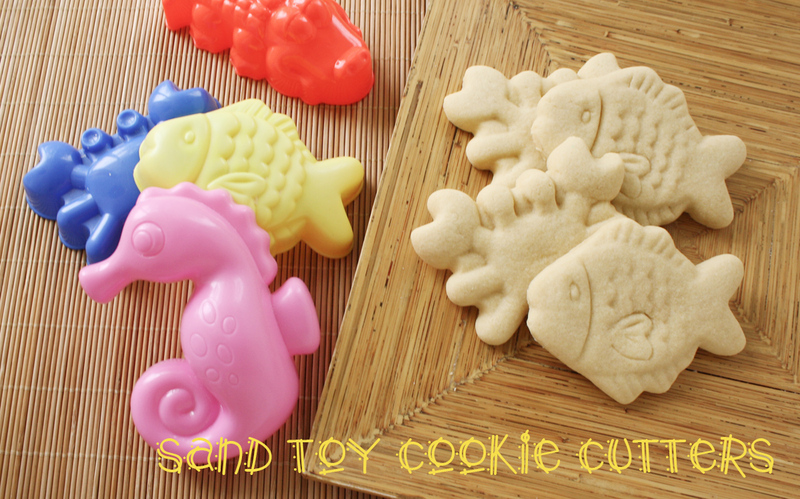 Why not jump to the fun part and let colored dough do all the heavy lifting? 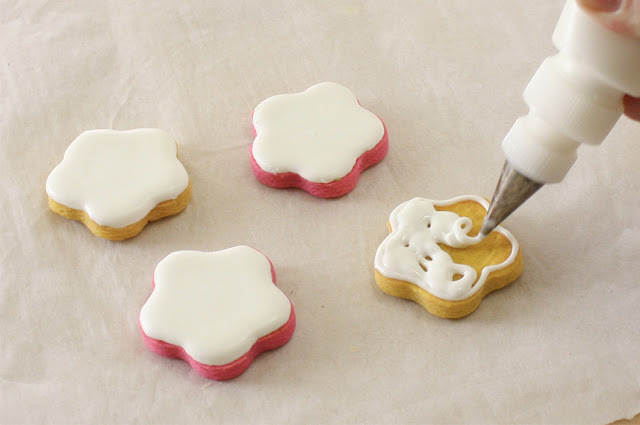 Just like making gingerbread at Christmas you can make simple red hearts with pretty lace piping for Valentine's Day or orange cookies with black piping at Halloween. 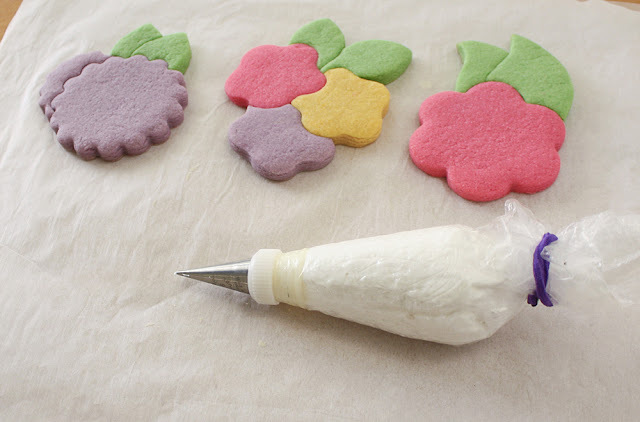 Today I'm going to make pretty, and oh so simple, colorful flowers for Mother's Day! All you need to get started is your favorite cookie dough and gel food coloring. 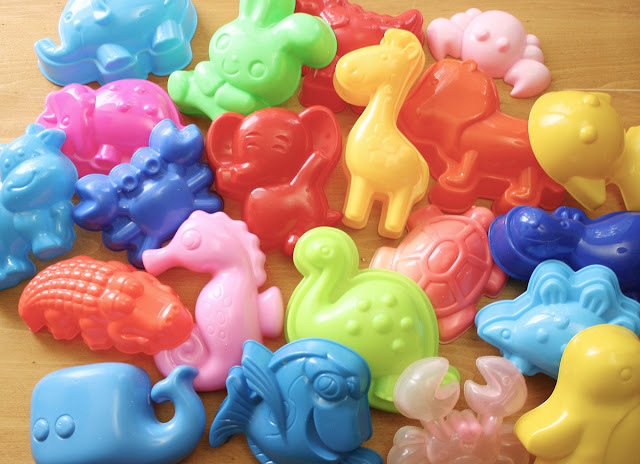 It is important to use gel colors because the watery-type food coloring will make the dough sticky and the cookies will spread during baking. 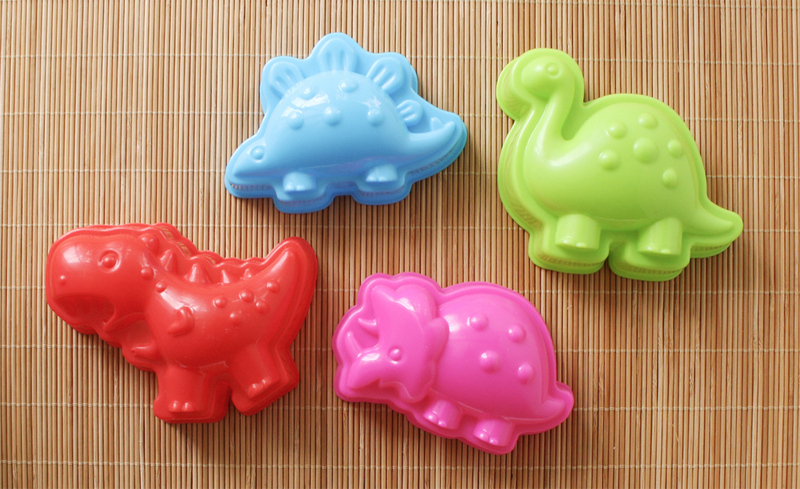 Once your dough is mixed add a few drops of your gel color. 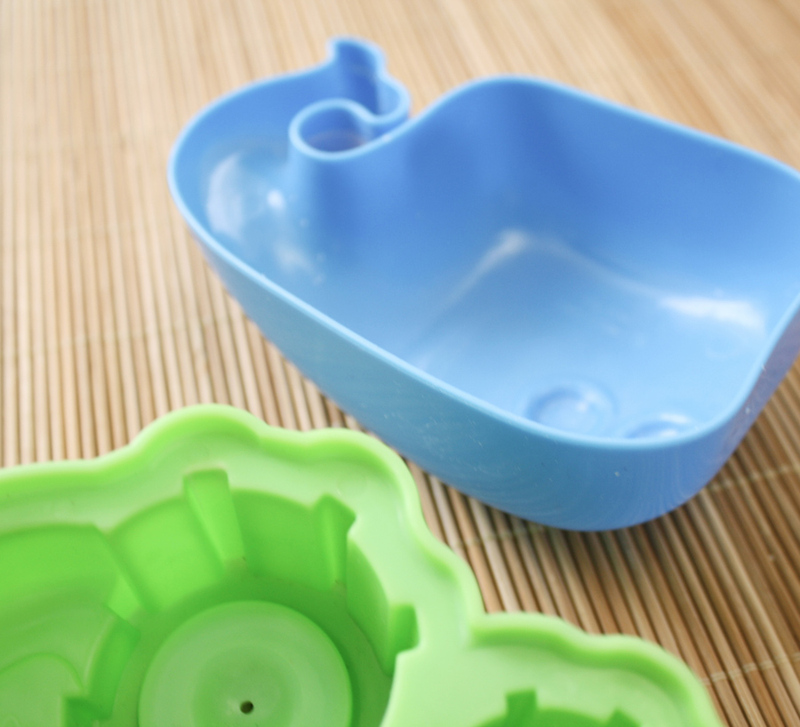 If you are using the Wilton pots scoop the gel color out with a small palette knife. 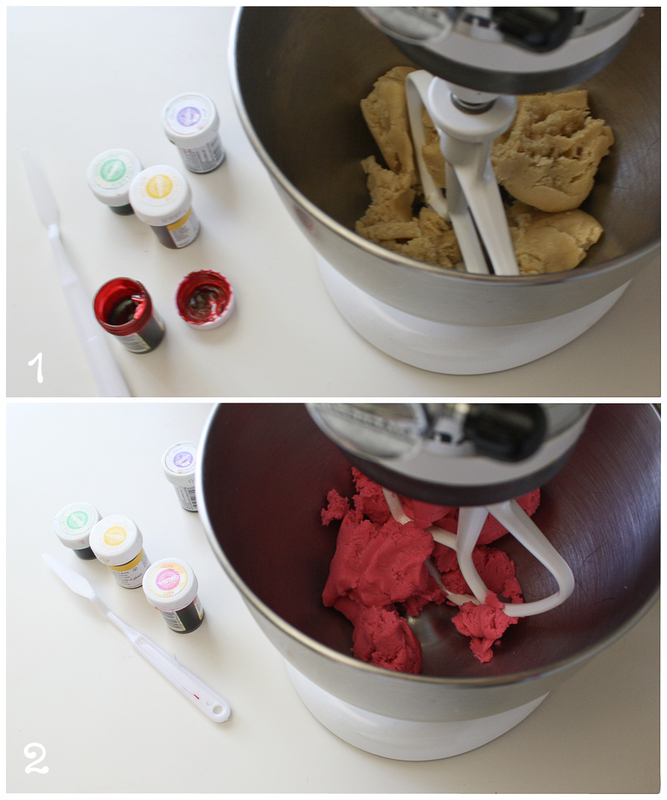 I prefer to mix the color into the dough with my stand mixer so my hands don't turn a shocking pink! I usually don't chill my dough before baking but if you do then color the dough before chilling. The color will deepen even more as the dough chills in the fridge. Also, don't worry if the dough color is a little shocking because the color will fade a bit during baking. Because you're going to leave so much of the cookie's surface exposed during decorating you want the cookies to have nice, smooth tops. To ensure smooth cookies roll out the cookie dough between sheets of parchment paper. 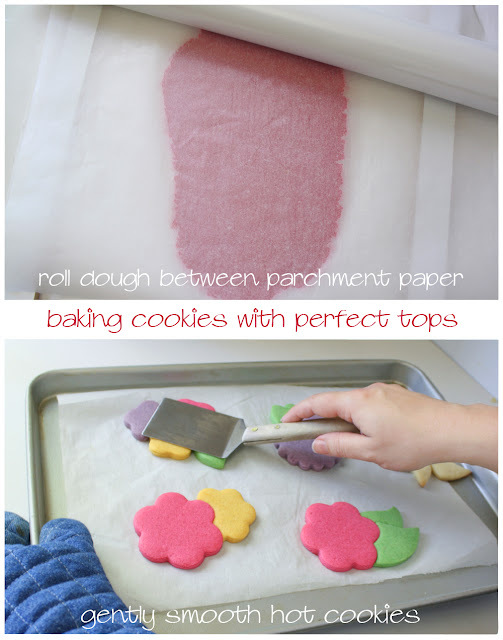 If you use rolling guides your cookies will also be perfectly even. I always roll my cookies this way because I don't have to add any extra flour! When the cookies are hot out of the oven GENTLY smooth them with a cookie spatula. You don't want to press down on the cookies because you aren't trying to flatten them and you could tear the soft tops. Just let the weight of the spatula smooth down any little bubbles or bumps that may have risen up. When the cookies are cool you'll have a nice surface to decorate! Now you're ready to pipe the details. My favorite thing about decorating cookies like this is you can use just one color of icing. How easy is that! 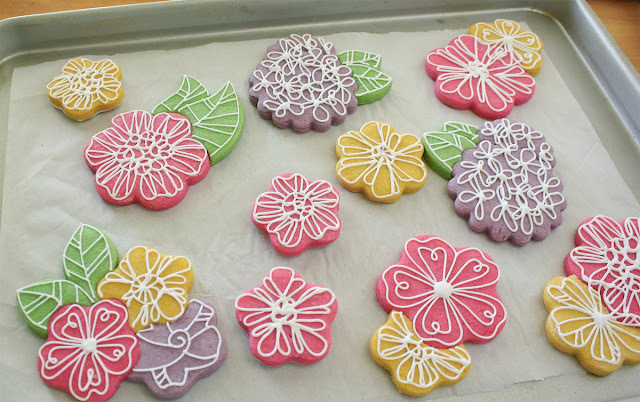 You could use coordinating icing colors of course but one bag of piping icing is all you need. I like to use a piping consistency that is just a little on the soft side. That way all the little points flatten themselves out. Doodling in icing is so much fun and it becomes really addictive. Don't worry about whether all your loops and dots are "perfect" just have fun with it. Make them as simple or as complex as you like! You could also try brush embroidery on these or the look of lace. If the piping alone isn't enough icing for your tastes then start by adding a coat of icing to the back of the cookie before you decorate. Let the icing dry overnight before you flip the cookies over and pipe the tops. Try to use as white of a cookie dough as possible. The dough will lighten a little during baking but if you normally use spices or brown sugar in your sugar cookies switch to a whiter recipe for these. Unless you want all your colors to have a vintage feel and then by all means use brown dough! If the color of the dough is a little uneven after mixing then knead it by hand for a minute. Wear plastic gloves to avoid coloring your hands. The colors of the dough will fade a bit during baking so tint the dough a little more intense than you want it to end up. Keep a very close eye on your cookies while baking so they don't brown! Have a great weekend and hug a Momma! May 4th is a favorite "holiday" of Star Wars fans because of the punny goodness of saying "May the Fourth be with You!" 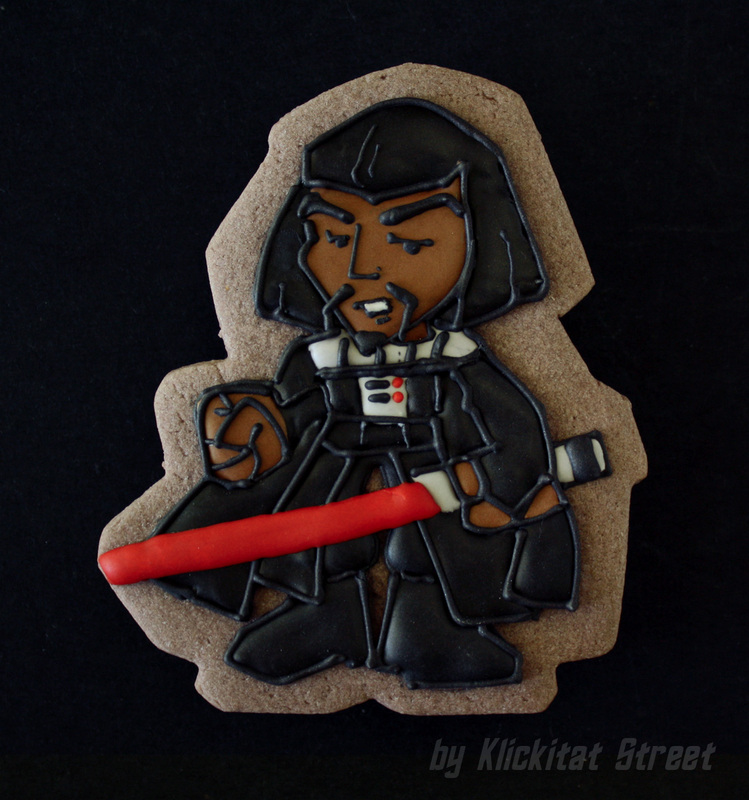 Last year several of the cookie artists I stalk on the internet were posting their Star Wars cookies and I didn't have any so I had to step it up this year. While it isn't quite the fourth yet these aren't quite Star Wars cookies either! The next installment of the Star Trek movie reboot series is coming out in a couple of weeks and I for one am looking forward to it because the first one was so good! Writer/director J.J.Abrams did a great job of taking the series in a new direction while still preserving the original series. So much so that Disney went and hired him to direct the new Star Wars trilogy coming in 2015! Woot! 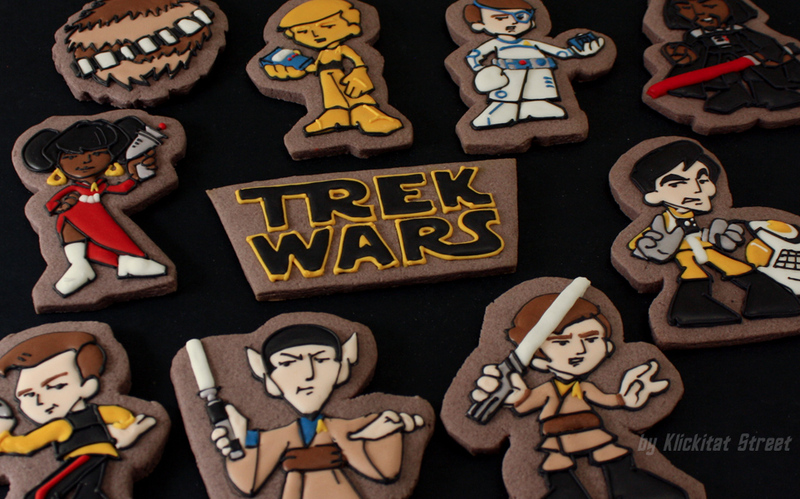 I figured that deserved a Star Trek/Star Wars cookie mashup!. 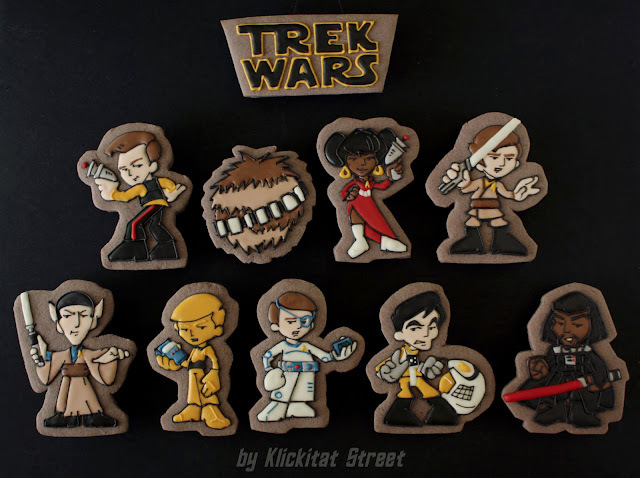 The design for the characters came from these super cute cartoon versions of the Star Trek guys called Quogs and then I gave them the Star Wars treatment. It was kind of surprising how well both casts melded together. Spock as Obi-Wan Kenobi is a no-brainer. In the Star Trek reboot Chekov is a wunderkind so he gets to be Luke. 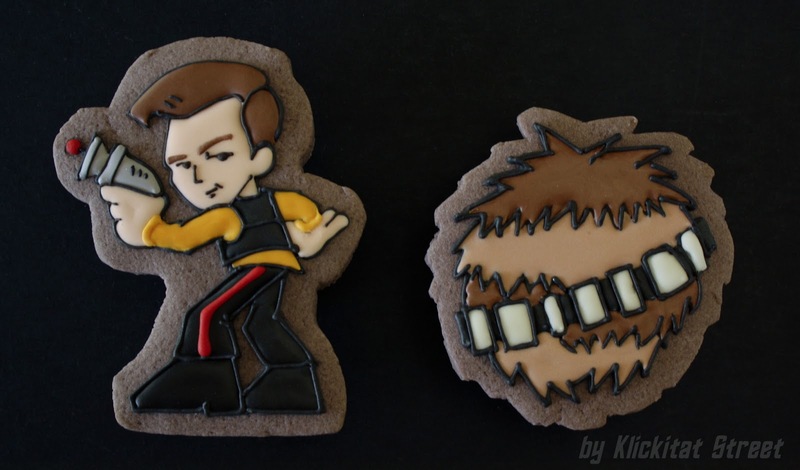 Kirk as Han Solo of course and a Chewie tribble (mmm...tasty). 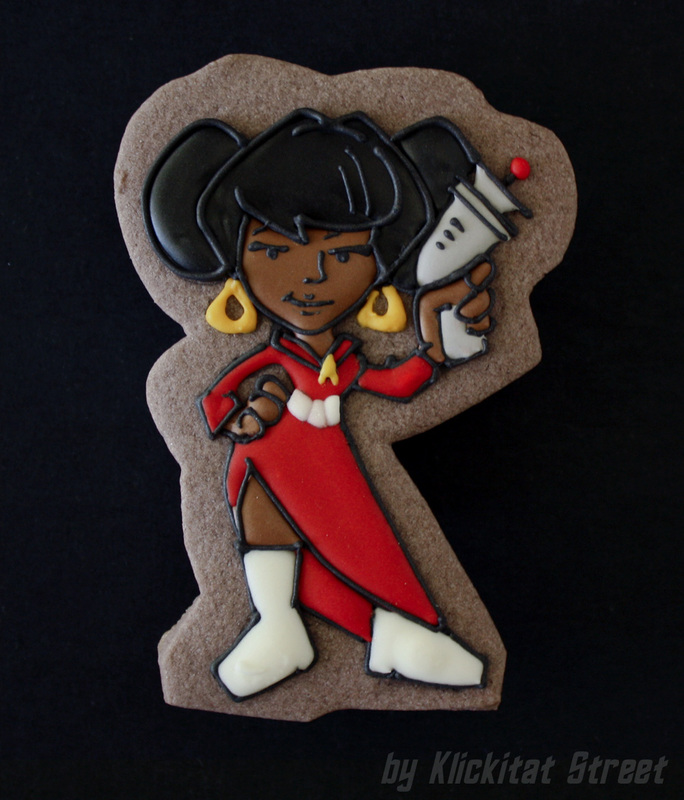 Even if Princess Leia and Uhura weren't the only girls it would still be a good fit because they are both a little sassy. Dr. McCoy as C3PO and Scotty as R2D2. I think Scotty "R2D2" is my favorite of the group! 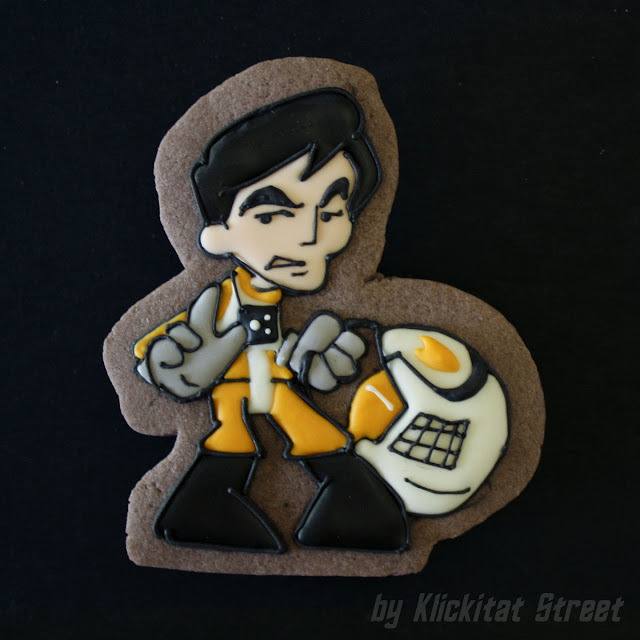 Sulu as a Rebel Pilot. Okay I can't decide if I like Scotty or Sulu best but it's definitely one or them! 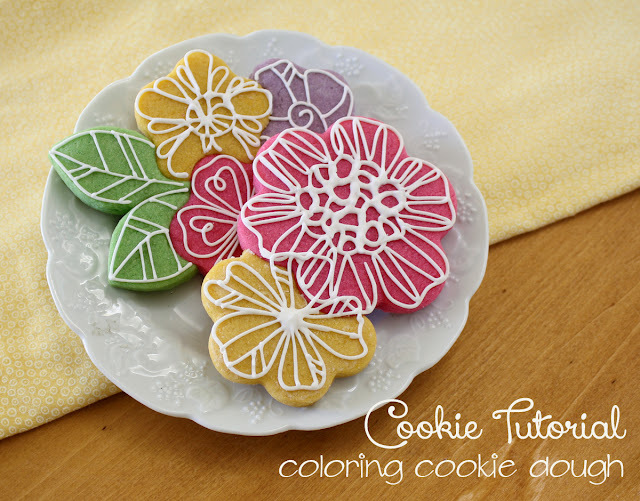 Cookies like this are somewhat complicated and time consuming, for me anyway, and I don't really have a tutorial for them but I'll lay the steps out for you. I made a few adjustments to the Star Trek Quogs in Photoshop and then printed them at the actual size the cookies were going to be. 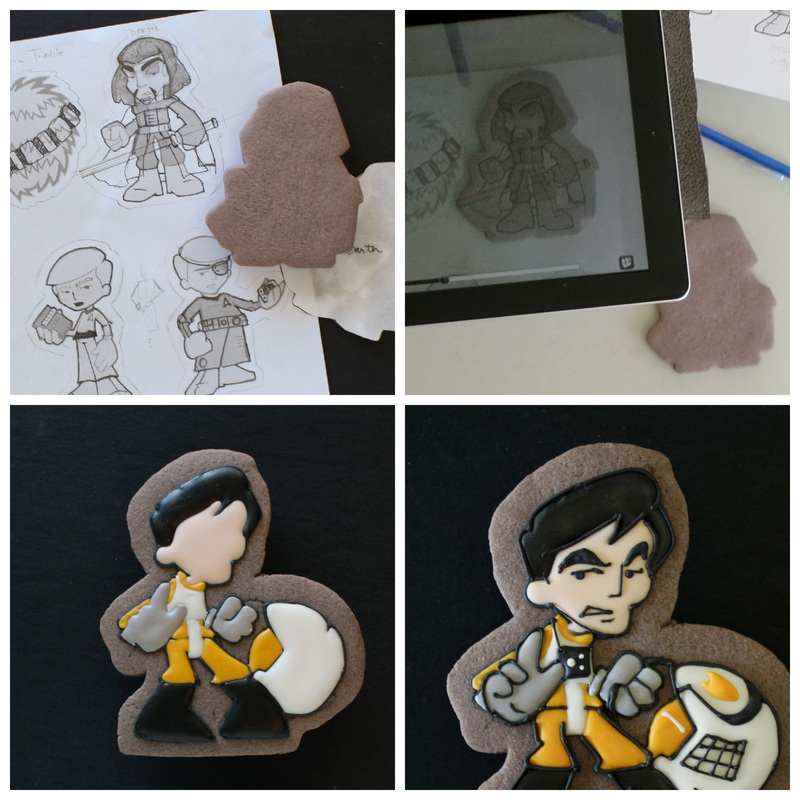 I drew the Star Wars costumes over my printout, traced their general shape to a template and hand cut the cookie dough. And finally I added all the little details. Upon the announcement that Disney would be making the new Star Wars trilogy Mike at SemiSweetDesigns made an amazing set of cookies starring Micky and friends! He also has a super cute Ewok cookie tutorial! 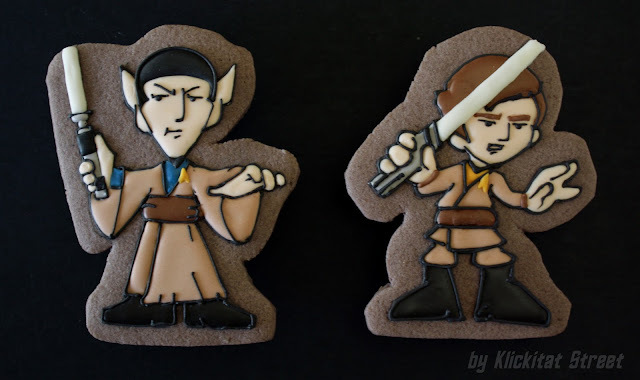 Callye of SweetSugarBelle shows you how to make Star Wars cookies from Christmas cutters and Spock Cookies too! 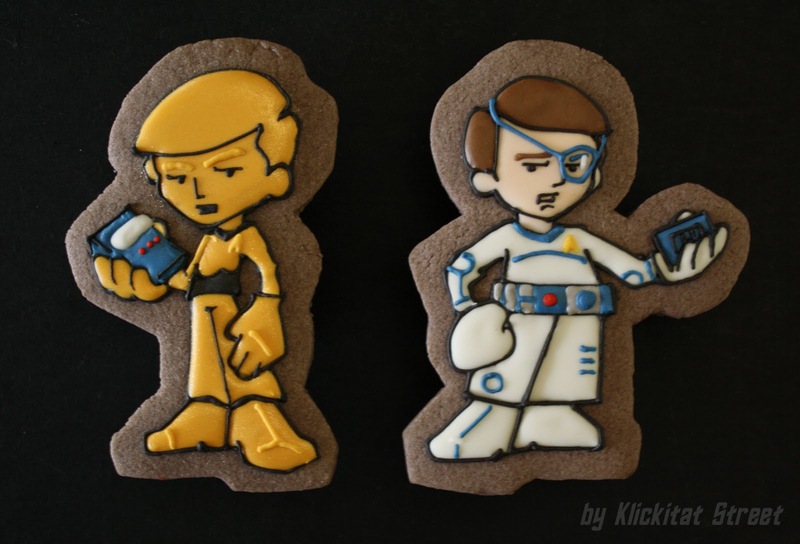 One of my favorite cookie artists, Jill of the Funky Cookie Studio, makes everything awesome like these Star Trek cookies. Enjoy your weekend and May the Fourth be With You!